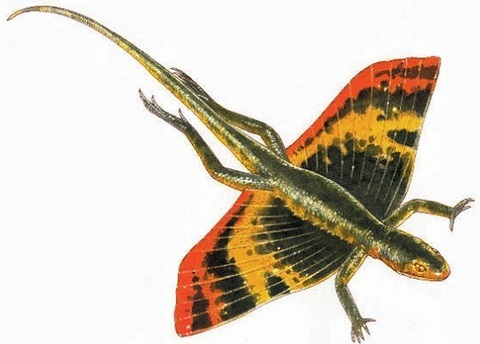 Some lizards discovered in the fossil record, like Icarosaurus and Kuehneosaurus (immediate right) resemble the flying dragon, Draco (far right), which is still found in southeastern Asia. This small lizard does not really fly, but leaps and glides hundreds of feet like a flying squirrel. 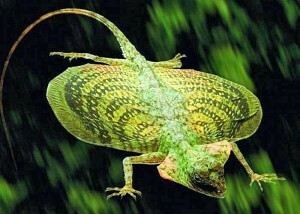 This enables the lizard to escape a predator by sailing safely to a landing place elesewhere in the canopy. The frilled lizard, Chlamydosaurus kingi, lives in northern Australia and New Guinea. 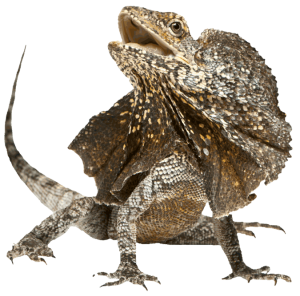 When the lizard is threatened it opens its mouth and brings the frill forward from where it normally rests on its shoulders. In a 8 inch adult the frill may be 7 inches across. This defensive action intimidates predators, facilitating the lizard’s escape. It also can run bipedally, holding its forelegs and tail off the ground. Jurassic Park portrayed the dinosaur Dilophosaurus with a neck frill just like a frilled lizard. The movie generated an increase in demand for frilled lizards as pets. Various lizards are known to use their curious appendages for communication, as well as for defensive purposes. 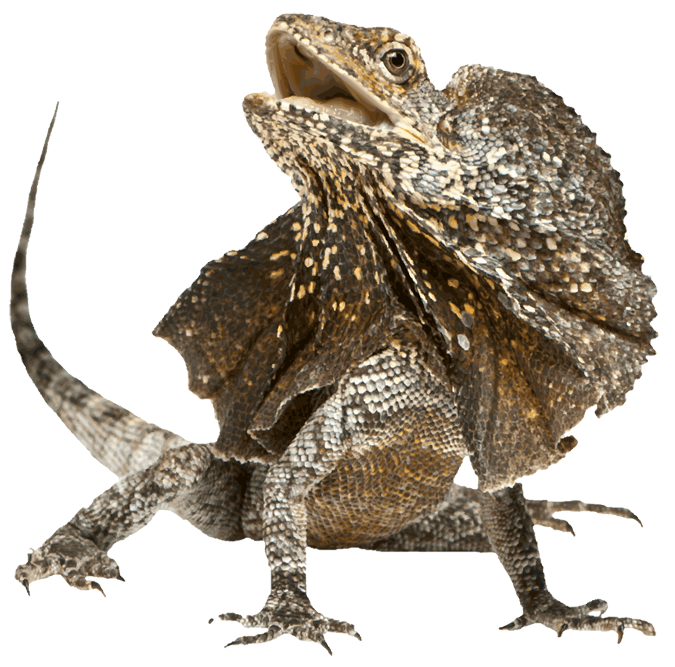 The Australian Bearded Dragon, for example, utilizes an elaborate social communication system, involving rapid head bobbing, “push-ups,” arm waving, tail twitching and displaying its beard. Some whiptail lizards use the strange behavior of stopping all forward motion and waving a front leg at a potential predator. It is thought this signals, “I see you and can outrun you. So don’t bother trying to catch me!” One wonders if some dinosaurs might not have utilized similar means of communication on a larger scale.